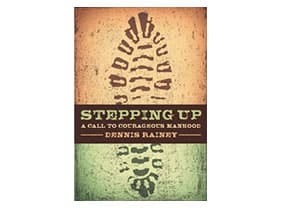 Stepping Up gives men the vision and the tools to live godly, courageous lives. Ten-week, small-group study for men dives deep into life-changing biblical content to show what it means to live godly courageous lives. 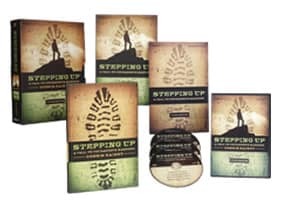 "The Stepping Up series was amazing. Nine men met each week and our attendance held strong the entire session. On night one, I was fielding questions about start and end times but by week three that was replaced with guys visiting for 30 minutes or longer after we wrapped up." "I have to say this was a wake up call and a great reminder that I need to step up to become a better leader in my household. Also, a great reminder that I need to step up and gain courage to defeat the giants that have been hindering my walk with God. Going through this, I definitely gained my "bearings" on what it takes to step up and become a man of God!" "A woman approached me this morning in tears. At first I was concerned that something was wrong, but she actually wanted to come and thank me for the Stepping Up classes we are currently holding. She was on the phone with her husband this morning and he . . . offered to pray with her, something he had not done in their previous 28 years of marriage." "In one way or another, the men attending shared the revelation that in order for them to step up and step out in courageous manhood they need Christ and His power to be their fuel—their wisdom and strength."